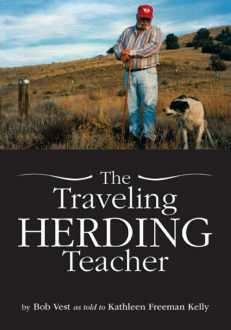 This comprehensive collection is a must for all herding enthusiasts! Printed in full color, this hardcover bound 676 page book includes over 1500 photographs, diagrams, and charts, many never before published. The images present a photographic story of how the dogs from the past have influenced the breed as we know it today. The Mountain West equation was one of the most successful in the history of the Australian Shepherd breed. The combination of Jay Sisler, Fletcher Wood, and other dogs of that general type created the highest levels of intelligence, working ability, protectiveness, and versatility. With the help of others personally familiar with these dogs, the author presents humorous, inspiring, and heart-felt stories shared by the owners of these foundation bloodlines. Documents about the background and lineage, registration papers, genealogy flow charts, and information establishing type and character of this special group of dogs within the Aussie breed is also included. Australian Shepherds of the Mountain West: Preserving the History of this Unique Line of Aussie Herding Dogs! is also available through Amazon and BN or ask for it wherever books are sold. 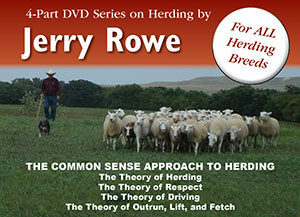 Jerry Rowe’s training series on DVD – This link will take you to the Twin Creek Herding website! I love my copy of this book. A brilliant investment for all Aussie Shepherd lovers. A very important piece of information for all the breeders and Australian Shepherds owners! Must read! Amazing for lovers of these old bloodlines. This wonderful book written by our friend Kris Toft, contains not only a chapter on Jean Taylor/Silverledge, but also has TONS of pictures of so many dogs that are in the pedigrees of our dogs today. It is a fascinating look into the history of the breed. Take a look! I have read it cover to cover. Editorial Review – You will be grinning ear to ear as you recognize some of the traits—superior intelligence, good judgment, discipline, self-determination—many of us still cherish in our dogs today. 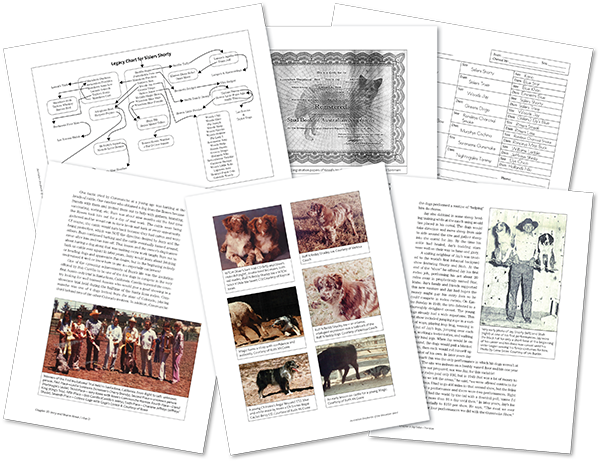 Must-Have Breed History Resource To clear Up Matters of Identity – Kris Toft’s book is a treasure trove of early breed history featuring significant dogs and people that many with Aussies today may know nothing about. For anyone with an interest in the origins of this breed this book is a must-have. Toft’s style is that of a story-teller, engaging the reader in the lives of both dogs and people. The factual content has been meticulously researched: A bibliography includes a chapter-by-chapter list of sources. The text is lavishly illustrated with photographs—many in color—giving the modern reader the opportunity to see the breed as it was. It is a look not dissimilar to that of modern stockdog lines but one from which the show lines are increasingly diverging. There are also pedigree charts. Lots of them. Toft was a life-long “pedigree hound” and the book contains not only pedigrees of significant dogs but “Legacy Charts” showing important descendants of those dogs. The only thing I wish the book had that it does not is an index. I wish the publishers would consider an e-book format to make the content more affordable and accessible and especially to reach the younger readers who will carry forth the legacy of this breed but tend not to purchase physical books. But for me, this volume is worth every penny I paid for it. Must-have reference text for working dog enthusiasts – Anyone with an interest in the history of working dogs in America must have this book on the shelf. Many may lay claim to knowledge of Aussie history, but there can be no doubt that it rests between these covers. Australian Shepherds of the Mountain West is a well-written, accessible and exhaustive resource, full of facts and stories and pedigrees and photos. Oh, the photos! 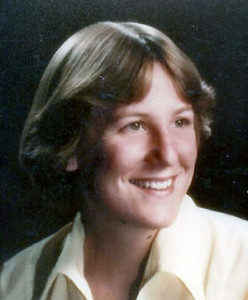 Kris Toft’s love of the breed and her lifelong devotion to the preservation of working ability is evident on every page. WOW! I’ve had Australian Shepherds since the early 1970s and love them. This book interweaves the early breeders and their dogs, the pedigrees, and hundreds of photos! I loved the stories that made me feel I knew both. I have several other books on Aussies, but this one is the best. Love this book, every Aussy owner really would LOVE this book. A must have for Aussy lovers. Nice price & timely shipping. Wow! What a great job, and beautiful book! Just awesome. I just wanted to say thank you for everything [the publisher] did to make Kris’ book a reality! I got my copy and I must say it is amazing. All the never before seen photos, all the history, all the stories – it is just marvelous. The information is amazing, pictures amazing, and so well written! [The author] managed to tie all of the elements (dogs, people, history) together so well! There is so much information here that you can’t just read it like a normal book – you have to digest it in bits and then take the time to absorb it. It’s factual, it’s funny, it’s personal, it’s history, and it’s just AWESOME! I love it! The text is well-written and informative. The photos and legacy charts are especially wonderful. Her book makes very clear how much Ms. Toft loved Aussies. A must for any Australian Shepherd lover and owner. OH MY GOSH…The best well spent money for a book in a long time. History, history, history, of our beloved breed. 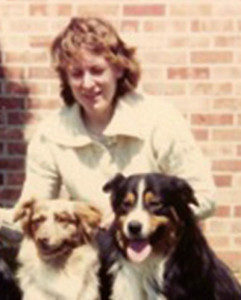 My husband, Jerry, and I, have been associated with the Australian Shepherd breed for over 50 years. Our kennel, J Bar D, is featured in Chapter 15 which allowed us the pleasure of reviewing an early draft of this book. The amount of information included makes this a true documentary of the history of the breed! The copies of original pedigrees and other information is beyond what we expected. The pictures and wonderful stories are a delight to read, it added interest, and gave us a personal connection to each chapter. The flowcharts provide a great visual understanding of the many lines of dogs that were affected by the Australian Shepherds of the Mountain West. We are excited to have available one book that contains new information about the early history of the Australian Shepherd and that documents the information with copies of original pedigrees and colored photographs. Having colored photos is so important because there are many color variations in the breed. 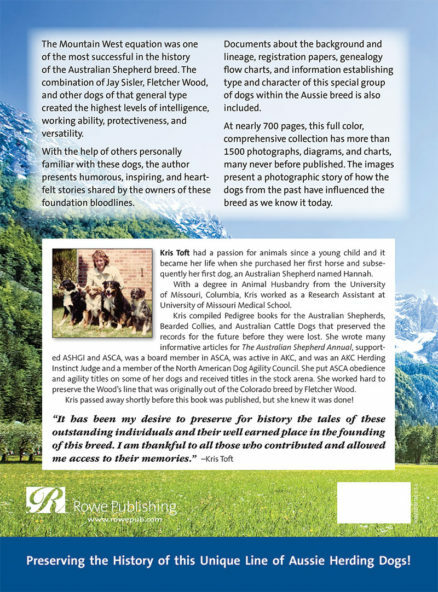 The information on Jay and Gene Sisler, Fletcher Wood, and Dr. Kenneth Green, alone, makes this book valuable for anyone interested in the original Australian Shepherds and how they influenced the breed as a whole. The recorded history presented throughout the book preserves facts that could be lost forever because over time, as the breed advances and the dog’s job changes, so does the breed. Jerry and I highly recommend this book. Just received my book. Wow…if you are an Aussie fan, you are going to LOVE it! I couldn’t believe the size…it’s huge! The photos are amazing. 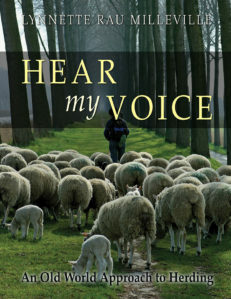 Editorial Review – Kris Toft has left the Aussie community with a wonderful, detailed book. Not knowing her before she passed, you still get a sense of the person she is and her deep love and knowledge of and for the breed through her writing. That she cared so much as to research and write this book while battling cancer, makes this all the more phenomenal and says just as much about her. It is something that holds value for everyone involved with Aussies. For those who have been around the breed for years, they will likely find comfort and nostalgia in old friends and dogs long passed and even some new information that they have not seen or heard before. For newer enthusiasts and those just beginning their involvement with the Australian Shepherd (and even just people with a love for history) this book is a priceless educational tool. 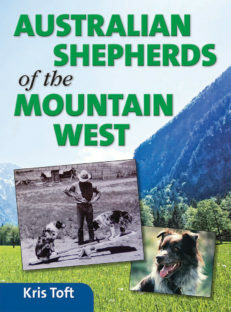 The history of the American West is echoed in the development of the Australian Shepherd as a whole, but more specifically in the type of dogs that inspired Kris to write Australian Shepherds of the Mountain West. Many new people will hear of Woods dogs, Wood’s type dogs, and others but it can be difficult to track down exactly what they are and how they are different. Even when you have managed to find what makes them distinct from other types of Australian Shepherd, you are still left with a vague impression that there are distinct strains of Woods dog and an amorphous idea that the Woods bred dog and the Woods type dog are not quite exactly alike. Until Australian Shepherds of the Mountain West came along, that information was scarce, hard to find, and being lost in great quantities as breeders passed or retired from the breed. 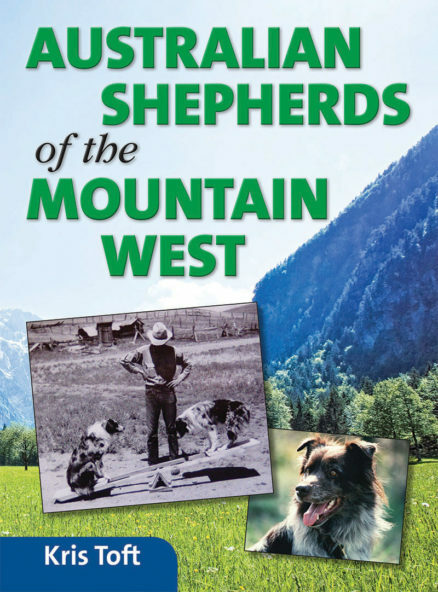 While information on many great lines of Australian Shepherd can be readily found on the internet or in other books, much of what is contained in Australian Shepherds of the Mountain West can only be found in the book and is located, publicly, nowhere else. By writing this book Kris has not only provided an educational tool but filled critical gaps in the knowledge of the breed. The future of the breed is brighter with a community that has available access to a fuller understanding of the breed. Not only is insight into the breed provided but through interviews and letters of the breeders and photos of the dogs, this book provides a look at the development of this portion of our country through the filter of the dogs and the people who owned them. It can easily be labeled “required reading” for all who wish to know this breed, the people surrounding it, and its history.